Ah, Spring. The mud is drying, birds are singing, daffodils are blooming, and the new DCF List is out! Click here for the 2015-2016 DCF List! Every spring, Vermont is graced with the arrival of a new crop of highly recommended books for readers. 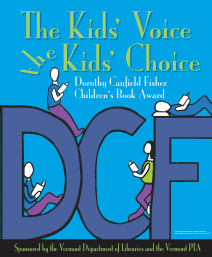 For our youngest readers, it's the Red Clover list, for our older readers, it's the Green Mountain book award list, and for our middle-age readers, it's the Dorothy Canfield Fisher Children's Book Award. Take a look at the new list, and come on in to the library to check one out!